I can now finally recommend a Dior handbag. I am so excited because it's been such a long time since I genuinely believed Dior was rising up to its iconic legacy. 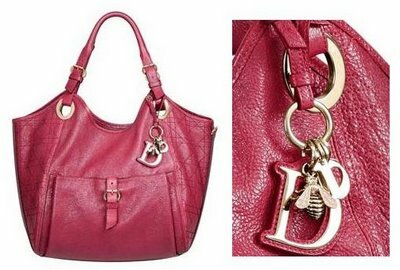 The Dior Bee Tote (see the cute little "bee" charm pictured right) is crafted from shiny deerskin leather and features dual buckled top handles, exterior 'cannage' top-stitching and front buckled pocket. The gold-tone hardware is a perfect compliment to red color of this medium-sized (12.5 x 16.5 x 8.5) tote, and I'm particularly impressed with the fact they took the time to give the Bee Tote a zippered closure instead of opting for the more in vogue open top. This is a real beauty in person. The photos simply do not do it justice. A larger version is available in a very chic taupe color that I highly recommend as well.